We returned this morning from Scott Moore's 2.5 day private charter. This group of friends from Las Vegas is serious about fishing and brings only 20 people out on our 85 foot boat. They have been fishing with me since 2002 when I first started running the Dominator. We ventured down into Mexico and day one found us about 50 miles south of San Diego scratching at tuna and dorado. We found the magic kelp at 4PM with a chaotic bite on jumbo dorado and ravenous Yellowfin Tuna! You could look in the water and see fish everywhere. Yellowfin, Dorado, Yellowtail, Skipjack, and even wahoo were zooming around in the corner! You could literally pin on a bait and watch the fish and select the one you wanted to catch! A nice sardine casted way out on the perimiter almost guaranteed a big bull dorado. An anchovie dropped down directly in the corner would be a Yellowfin. We call it "aquarium fishing" and it's something I hope all fisherman get to see at some point. A few guys fishing the popper in the bow had their limit on Yellowfin in five casts. Day two was spent exploring the purple water between Colnett and San Martin Island in 75 to 77 degree water with a tropical feel to the weather with the remnants of Hurricane Linda upon us. We would have periods of heavy rain and lightning with strong winds, only to be gone moments later with the sun peaking through and the winds backing off to zero. We went from kelp to kelp, rounding out our Dorado limits and adding more Yellowfin Tuna to our tally. Then at 11:00 AM, the cry of "HOOOOOOK UPPPPPP" signaled a game changing event. The holy grail for local sport fishing. A trolled marauder was hit and was getting spooled! This was no dorado or football tuna. 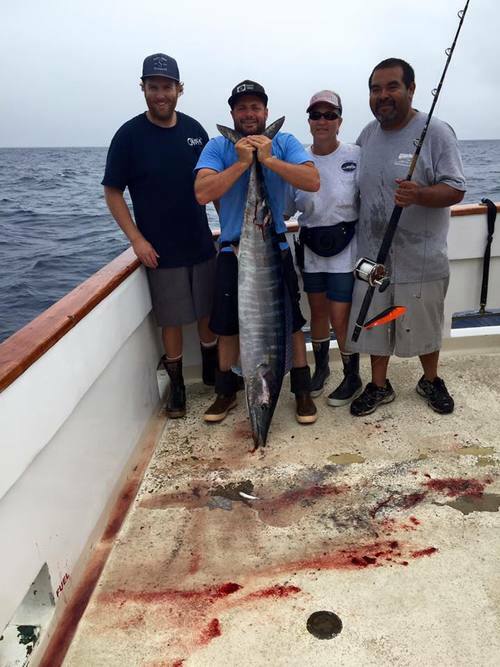 With the assistance of Oscar, our galley cook, the first ever Wahoo (that we know of) was gaffed by Captains James McDaniels and Scott Dinwiddie. Glenda from Las Vegas did a great job reeling in the fish and bringing it to the surface. It weighed in at 62 pounds. Trip totals were: Limits of Dorado, 80 Yellowfin Tuna and one wahoo.